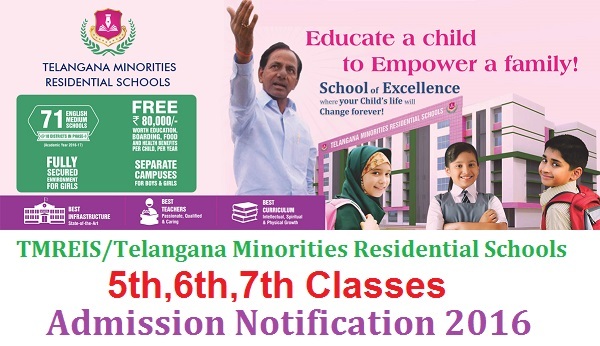 TMREIS/ TS Minorities Residential Schools 5th, 6th, 7th, 8th Classes Admissions Notification 2019-20 : TMREIS/Telangana Minorities Residential Schools 5th,6th,7th Classes Admission Notification 2019, Admission into Class V/VI/VII/VIII for the Academic Year 2019-20 Application Form available at http://cet.cgg.gov.in/tsmw/TMREISRegistration19.do ,#TMREIS/TMR schools 5th,6th,7th,8th Classes #Admission notification 2019 and Last date for apply is 31-03-2019/TMREIS Online application form/Application Form for Telangana Minorities Residential Schools 2019-2020 /TS Minorities Gurukuams Admissions 2019. Telangana Minorities Residential Educational Institutions Society (TMREIS) has given the 5th, 6th, 7th and 8th Classes admissions 2019-20 notification and Applications are invited online for admissions into V, VI , VII,VIII Classes (English Medium) in (201) Telangana Minorities Residential Schools for the Academic Year: 2019-20. TMREIS Notification, Online application form, eligibility criteria, last date for apply online, how to apply and important dates,eminities, previous study,required documents given here. TMRS Institutions Society President had inaugurated the online registration programme for TMR Schools. As part of Minorities development and KG to PG Mission, the Honourable Chief Minister Sri. K. Chandrasekhar Rao Garu has sanctioned total 204 Minorities Residential Schools in 31 districts of Telangana and 2 Residential Junior Colleges where more than 1 lakh minority students get quality education every year. This is a landmark initiative in the Indian history which has created an opportunity to minorities and a stepping stone to educate economically backward Minorities children. TMREIS has an excellent track record of establishing 204 Minority Residential Schools and 12 Residential Junior Colleges in a span of 2 Years time in 31 districts of Telangana. The government was offering not only high quality education but also quality food and health facilities. Telangana Minorities Residential Schools (TMRS) Online registration was launched for admissions. Online and offline admissions to 204 schools opened. The display of classroom furniture and facilities provided at these schools was a big hit. Both parents and children were seen gawking at the smart chairs and tables, library books, health and lab facilities. మార్చి31 వరకు దరఖాస్తుల స్వీకరణ: తెలంగాణ మైనారిటీ రెసిడెన్షియల్‌ ఎడ్యుకేషనల్‌ ఇనిస్టిట్యూషన్స్‌ సొసైటీ (టీఎంఆర్‌ఈఐఎస్‌) పాఠశాలల్లో ప్రవేశాలకు ఈసారి ప్రవేశపరీక్ష నిర్వహించనున్నారు. భారీ డిమాండ్‌ నేపథ్యంలో ఈసారి ప్రవేశపరీక్ష నిర్వహించనున్నట్లు మైనారిటీ శాఖ, టీఎంఆర్‌ఈఐఎస్‌ కార్యదర్శి తెలిపారు. రాష్ట్రవ్యాప్తంగా 204 పాఠశాలలుండగా.. ఐదో తరగతిలో ప్రవేశాలకు, 6, 7, 8వ తరగతుల్లో ఖాళీగా ఉన్న సీట్లకు, ఇంటర్‌ మొదటి ఏడాదిలో ప్ర వేశాలకు పరీక్ష నిర్వహిస్తున్నారు. మైనారిటీలకు 75 శాతం, ఇతరులకు 25శాతం సీట్లు కేటాయిస్తారు. దరఖాస్తులు ఆన్‌లైన్‌లో February 25 నుంచి మార్చి 31లోగా వెబ్‌సైట్‌: tmreis.telangana.gov.in ద్వారా సమర్పించవచ్చు. ఆన్‌లైన్‌తో పాటుగా అన్ని టీఎంఆర్‌ఈఐఎస్‌ పాఠశాలలు, కళాశాలల్లోనూ సమర్పించవచ్చు. హెల్ప్‌లైన్‌ నెంబర్‌ 040-23437909 ద్వారా కూడా తెలుసుకోవచ్చు. b. 6, 7, 8 తరగతుల విద్యార్థులకు ఏప్రిల్‌22న పరీక్ష నిర్వహించి మే2న ఫలితాలు ప్రకటిస్తారు. c. జూనియర్‌ కళాశాలల్లో ప్రవేశానికి ఏప్రిల్‌13న పరీక్ష నిర్వహించి, ఫలితాలు మే2న ప్రకటిస్తారు. The government has advanced the process of admission for Telangana Minorities Residential (TMR) Schools to Feb 25 to March 31 for Online Enrollment process had launched for 204 TMR schools for 2019-20 academic year. Mobile App developed for the purpose besides flagging off publicity vans. The TMR Educational Institutions Society plans to admit students in Classes V to VII. TMREIS admission process this year was advanced so as to wean away more children from private schools. Last year there was some shortfall in enrolment as children had already taken admission elsewhere. 1. The candidates may submit application online in http://cet.cgg.gov.in/tsmw/ www.tmreis.telangana.gov.in website. Admission will be given in the TMR Schools in the native district of the students studied during the academic year 2019-20. Completely free hostel facility, food , medical facility, free education, Text Books, Note Books, (04) pairs of uniforms per year. Applicants must not have born before and after the following dates. The selected Students shall submit all required Certificates at the time of Admission. #TS Minorities Residential Schools 2019-20 Admissions.